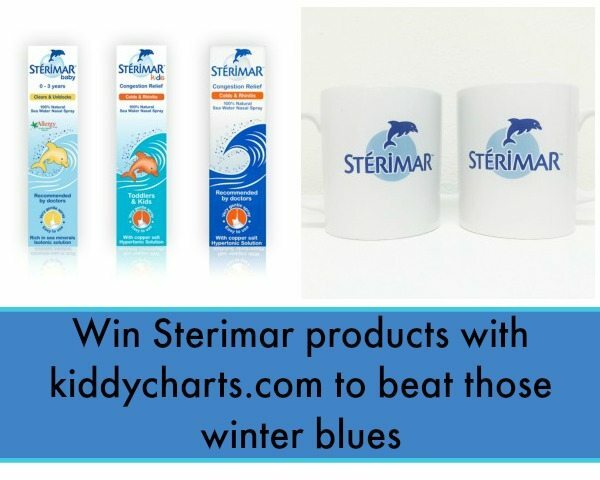 We are looking after your little ones this Christmas, Micro Scooters to keep them active, sofa’s courtesy of Tendre Deal for them to rest, and now some wonderful cold remedies to keep them well, and even a fab mug for you to use too, thanks to our friends at Sterimar! That means that there is something for all the family to help you fight off those winter blues with a little help from Sterimar. You can also visit our competitions listing as well. This gives you some of the other competitions around on the web, listed by what is ending soon, and all your favourite categories too. Enough about me, lets get on with the giveaway! Here is the widget, just fill it in as normal. If you enter you will also be given a unique url, which if you share and more of your friends enter, you will get more chances to win too. We do have standard giveaway T&Cs on KiddyCharts, so do check them out, the main point with this giveaway is that if you would like delivery before Chirstmas, you need to reply before 15th December to the notification of your win. This giveaway closes on December 10th at 11.59pm. as its day three, we are on to another section of our rhyme for you with our colours pages, so we have a Gallic feel, though I guess perhaps we should have done this yesterday given the French feel to that giveaway! Here are your French hens, make sure they don’t run away! brilliant prize, perfect for the winter sniffles.